PACIFIC OCEAN - Carrier Strike Group (CSG) 3 completed a group sail with USS John C. Stennis (CVN 74), Carrier Air Wing (CVW) 9, guided-missile cruiser USS Mobile Bay (CG 53) and Destroyer Squadron (DESRON) 21, May 11. Group sail provides a unique training opportunity to improve interoperability and coordination in preparation for an upcoming deployment. Integrating strike group units at sea creates the accelerated learning and training environment needed to increase effectiveness, readiness, and proficiency in the skillsets required on deployment. CSG 3 conducted counter piracy and maritime interdiction training, formation maneuvering, replenishments at sea, strait transits, anti-surface, anti-submarine, and anti-air exercises, as well as strike mission training exercising the full range of strike group capabilities. Group sail was the first opportunity for the different warfare commanders to execute command and control over the full range of capabilities inherent to the strike group. “During group sail we began to increase the tempo and complexity of our operations, both as the Strike Warfare Commander, projecting naval power ashore, and in support of the other warfare areas,” said Capt. Steven Hejmanowski, commander, CVW 9. 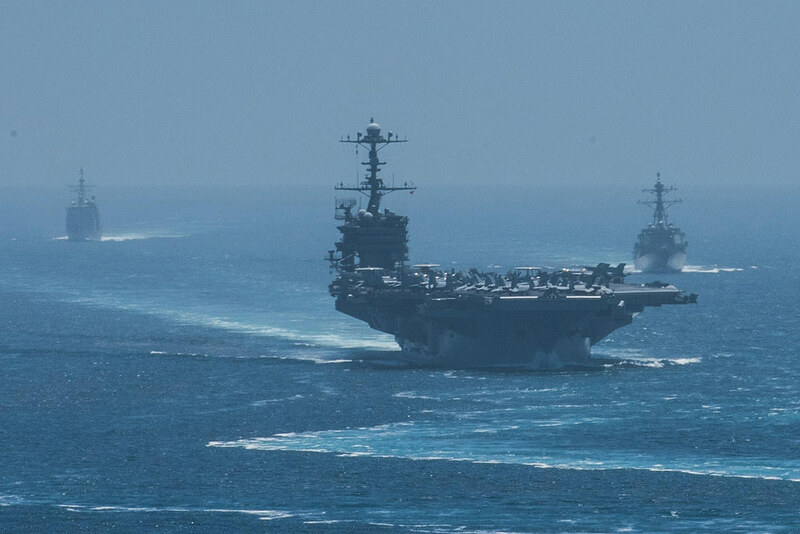 With five ships, more than 50 aircraft, and more than 6,000 Sailors, carrier strike groups can carry out simultaneous missions across multiple mission areas. The flexibility and readiness to meet any mission required are what makes CSGs the versatile and adaptable response option. Their ability to operate anywhere in the world without the requirements of shore-based infrastructure are mission enablers. Working together for the first time in over two years, the units comprising CSG 3 worked seamlessly, as if they had been training together on a constant basis. Providing a combat-ready force to protect collective maritime interests, CSG 3 demonstrated exemplary performance and exhibited continued professionalism, a reflection of the Sailors that work hard every day to stay prepared for the upcoming deployment. CSG 3 is underway conducting group sail training in preparation for its next scheduled deployment. CVW 9 includes Helicopter Maritime Strike Squadron (HSM) 71, Helicopter Sea Combat Squadron (HSC) 14, Airborne Early Warning Squadron (VAW) 117, Electronic Attack Squadron (VAQ) 133, and Strike Fighter Squadrons (VFA) 151, 97, 41 and 14. DESRON 21 includes USS Stockdale (DDG 106), USS Spruance (DDG 111), and USS Chung-Hoon (DDG 93).